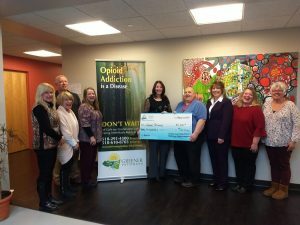 On March 21, 2019, Members of the Columbia Greene Board of REALTORS, Community Outreach and Social Committee were honored to present a check to Greener Pathways, a division of Twin Counties. These monies were donated by members of Columbia Greene Northern Dutchess MLS and The Columbia Greene Board of REALTORS at their Annual Holiday Gala. This will further the work that Greener Pathways does with invididuals fighting opioid addiction. Local REALTORS give back to the community throughout the year, with our 12 months of giving program. Our next event is a Spring Food Drive benefitting a local food bank in the area. Posted in Consumers, Home Page, News & Local Information, Realtors.